Big A, who is 4 years old, prefers carbohydrate-rich foods to anything else. 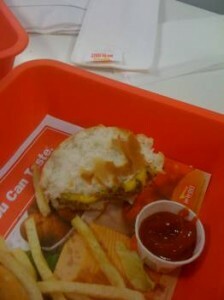 Check out exhibit A: the hamburger. As the picture shows, she picks at the bread part and rarely eats the meat (I think the bite taken out of it was my husband’s!). One time she actually put meat in her mouth but it came right out. The funny thing? When you ask if she wants a hamburger (hangerbur to her), she always says yes. In fact, she often says that she loves them. 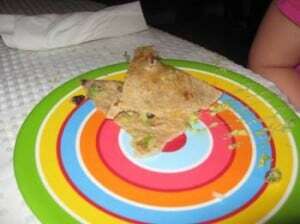 Now check out exhibit B: the Quesadilla. While she sometimes eats the beans and cheese inside, she often picks at just the tortilla. (Actually, I started making quesadillas in addition to burritos so it’d be harder for her to take apart — but she found a way!). And guess what she does with pizza? Eats the crust only. At her birthday party a friend came up to me asking, somewhat concerned, “Does Anna like pizza?” I told her, “she ate some — look,” as I hold up a crust-eaten piece. Is Big A doing this just to push my buttons? I don’t make an issue out of it, so I don’t think so. By calling attention to something like this we end up enforcing the behavior we don’t want. Truth be told, Big A doesn’t know she’s picky. 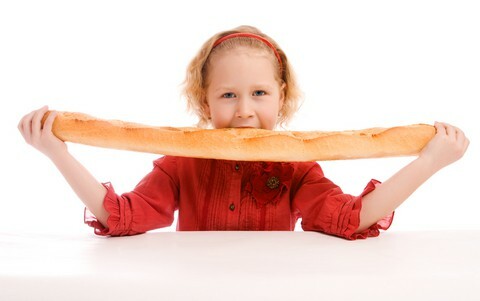 Carb-rich foods like bread and tortillas are easy for young kids to like. They are still energy-rich and don’t overwhelm the taste buds. Their texture is also very consistent — which is why some kids only eat the bread when faced with a new or different meal. As Big A slowly gets out of her fear of food stage, she will eat more and more of these foods. For more on this normal part of development, see this article. If I make a big deal and make Big A eat the meat/beans part of the meal, she may come to dislike it. And as of now, she loves quesadillas, hamburgers, burritos and other protein foods like salmon. This is part of her learning process. I’m excited because Anna has a new-found interest in spinach and wants it on her plate when we have it for salad. “I love spinach” she says. But she rarely takes a bite. As parents we have to be able to see the process of learning about foods unfold in front of us. I admit that at least for Big A, this process is much, much slower that I’d like it to be. And no doubt it’s frustrating. Some days I see huge leaps, other days regression, but mostly it’s itsy, bitsy steps like her showing interest in a new food. Since right before Big A turned 4, this no protein thing has intensified. So yes, I worry about her getting enough key nutrients from protein-rich foods like iron and zinc. She will eat eggs (French toast), is a huge milk drinker, cheese, meatballs and beans (those last two are sometimes foods) and she has been seen taking a bite of a turkey sandwich. I also have a multivitamin with iron that I give her on days she doesn’t eat iron-fortified foods or much iron-rich foods. We’ll talk more about this in my Kids’ Nutrition Series. I think the toughest part of the Division of Responsibility is that parents feel like they aren’t doing anything. And if there is one thing I’ve learned about feeding kids — not interfering with your kids eating is very, very hard. I often encourage Big A to try everything and leave it at that, then we talk about other things. When she says she’s done I ask her what her tummy says and let her know when the next meal is, then I accept the answer. We talk about eating (and trying) a variety of food at non-mealtimes. And I engage her in the process of food from helping me choose food at the grocery store to preparing meals. And even though she’s not eating the variety of food I would like, she has a positive outlook on a variety of food — a precursor to actually eating that way. And she does a great job of regulating her food intake. A small dinner is often followed by a bigger breakfast and vice versa. So tell me, am I the only one? Any carb queens or kings out there? Or should I say princesses and princes? 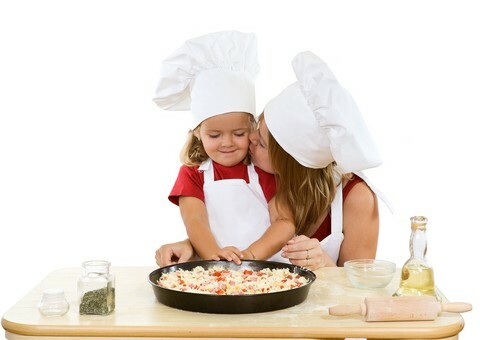 Are you able to see the small steps your child makes in learning to like new foods? 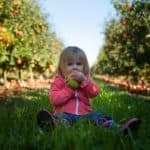 My kids were always big on fruit (which are carbs too) and crackery-type foods–especially if they were hungry. Hunger drives the “carb” desire, as it gets the blood sugar to normalize quickly. 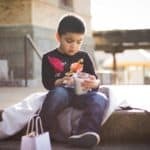 So my added comment would be that if you’re not on time with meals and snacks, you may see that your child goes for the carbs–it relieves hunger quickly & gets the blood sugar up–allowing your child to keep moving. YAY! I’m not alone! haha This was a fun post to read and reassuring too. My son says he loves certain things and then doesn’t eat them. You writing it out cracked me up! I have picky eaters too but I try to always serve at least something they like in the mix. For example, my son doesn’t like pasta so he just eats the bread. I just make sure he gets fruit or yogurt for “dessert”… so his supper ends up being fruit and bread. He also doesn’t like eggs so when we have a traditional breakfast, he just has bacon and toast. I also put a wee bite of the boycotted food on his plate and he has to try it. I like what a friend called it: “A thank you bite”. Watching my twins, who will be 3 in June, eat is like a little Ellyn Satter experiment. From the early days of introducing solid foods, G has been a huge carnivore and H truly loves her carbs. They are a nice little pair when eating out b/c I know I can order the hamburger so that G can eat the meat and H can eat the bread. It’s not always that straighforward, but most of the time that is how it ends up. Thankfully they both eat various veggies and lots of fruit, so we just try to put it all out there and hope it evens out over the course of several days. Extended family members try to bargain with them to eat 2 bites of this or all of that before they can have dessert. I try to ignore that and remind them to eat what they want, stop when they are full, and leave what they don’t want on the plate. Somehow it all seems to be working out, but as you say above not interfering is sometimes the biggest challenge. An even bigger challenge is trying to be polite when ‘outsiders’ try to question my commitment to following the Division of Responsibility. 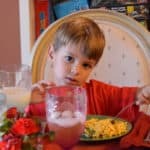 I have a ten-year-old who has “texture” issues with foods. She would ask for meatless cheeseburgers (just cheese and mustard, with pickle on the side and some fries) and “dry” spaghetti noodles (no spaghetti sauce, a little butter). She LOVES spicy foods, and would eat salsa, but only if pureed very, very well in my little food processor. Two days ago I made burgers. She asked for a cheeseburger. For some reason, I said “With meat?” and she said “Of course!” and ate the whole thing. My daughter is almost 4, and she is a carb queen. I’ve never really thought of her that way, since she also loves dairy & fruit, but meat hasn’t been part of the equation since she turned 1. She will eat buns with ketchup and mustard, but not hamburgers, and only recently decided she likes melted cheese on tortillas (she will still pick out beans & almost anything else inside). She also recently started eating pizza as well–I think the toppings intimidated her. Now she likes pizza with olives, red peppers, and mushrooms on it. If she has tortilla chips, she will dip them in salsa or microscopic amounts of beans. Of course, a multivitamin is required. Our daughters sound similiar. I think it’s the texture of meat that gets them! This is also my four year old daughter! I could make one hamburger (not that I ever have) and my four year old would eat the bun, my seven year old would eat the meat. You’re right though, not interfering is SO hard. My 4 yr old daughter is a carb queen too. She could live off them easily. Her latest addiction is frozen mini-waffles. She would eat them all day if I’d allow it. That and pretzels. And pasta. I was really proud of her the other day for eating her pasta with marinara sauce on it for a change instead of just parmesan cheese. Interestingly wanted to add that my 6 yr old is the opposite. She doesn’t care for carbs at all except she’ll eat bread with her meal if she’s hungry. She never orders fries at a restaurant (always fruit) and never eats pasta. I have a 14 yr old carb queen! Always has been and may always be one! She prefers to eat meatless and dislikes milk and eggs. Luckily, she has found a few foods to add to her arsenal. She likes veggie burgers and drinks soy milk. She has learned to eat a wider variety of fruits, vegetables and non-meat sources of protein than I ever imagined! We (our family) had to grow along with her. Thanks Cindy. Thanks for the insight. I love hearing from parents of older children. And you should know that I’m still a carb queen! I have fruit bats and protien nuts at our house. My daughter prefers crackers to bread but will always just eat the meat/cheese out of a sandwich. Burgers are little different but 1/2 way through sometimes she’ll ask if she can just have the meat/cheese. I think snacky lunches are a great thing. A little bit of everything on their plates. I find that my kids will eat better if there is less on their plates. My older son was a carb king until he was about 4. Now he eats a very balanced diet though he is picky about what he eats. My younger son is a sweetaholic. I have written about it a few times and I’ve linked to this post in tomorrow’s scheduled post (with a recipe). 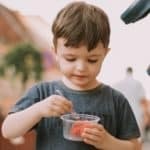 I’m in the midst of posting a series about my toddler Sam, who is going through an extremely picky phase at the moment. Even for dietitians, who have training and knowledge about this, it is hard to see our kids refuse healthy food over and over and over again! It is also hard to not attach emotion to that, especially after you’ve spent time and energy preparing a healthy meal. But I’m trying to keep my “game face” on! 🙂 Looking forward to following your posts about this topic. Good to read. I feel like I’m alone on this one. Many of my friends kids eat a ton and eat a ton of healthy food. Sigh. I have a 12 year old carb queen! When she was very young she ate a variety of foods with ease, loving many fruits and veggies. Meat and poultry has always been her least favorite, but she used to eat it in small portions. But, since the age of about 7 she refuses to even try many foods she used to eat. I try not to push but I am very concerned about her diet and health. Her diet is mostly bread, pastas, grains (not the health kind, I’m talking cereal and chips),and the occasional chicken nugget or burger; oh yeah she does like beans. She even picks meats out of casseroles and pasta dishes. If anyone has ideas I’d love to hear them. My 8-yr old younger daughter is a carbqueen. She loves buns and breads and will eat just plain rice for lunch. She’s also a dairy queen. She loves milk(especially with chocolate), cheese, yoghurt, buttermilk….Eats no vegetables at all although occassionally she might eat an egg. Even though your article gave me a little comfort to realise she was not alone in her ‘pickiness’, I’m still concerned about her nutrition. I see no one has been on this site for a while, what the hec, I will still vent. My grandson has not eaton a solid meal since 3 years of age, he is now 6. He only eats bread with honey or vegemite. Pasta with tomato sauce, deep fried chips with sauce, chocolate cake, dry biscuits and egg yolk, not the white. Seriously no meat, no vegies except the chips and no fruit except oranges. Loves juice and milo milk….so so frustrating. That’s it, day in and day out, oh the occasional wheat Bix. Has been to a specialist but she was not concerned.